Two children were among 10 people hurt in a shooting in the Moss Side area of Manchester, which police are treating as attempted murder. They were injured with what police believe was a shotgun with "pellets in its rounds" at a street party in Claremont Road at about 02:30 BST. Nine victims had "pellet-type wounds" and a man suffered a broken leg. The shooting took place at a party held after the first day of this weekend's Caribbean Carnival in Alexandra Park. The victims, including two children over the age of 12, with "pellet-type wounds" were not seriously injured but the man with the broken leg was in a serious condition. Another two people attended hospital later on Sunday to be "checked over" but their injuries are not thought to be serious, police said. Ch Supt Wasim Chaudhry, from Greater Manchester Police, said those injured were aged between 12 and their 50s and mainly suffered injuries to their legs. "Discharging a firearm... in as large a crowd as this is completely reckless," he said. "I think its more by luck than by anything else that people haven't suffered life-threatening injuries," he added, saying the motive remained unclear. He said two armed officers were "quickly in attendance, within a minute in fact", followed by other officers. Caribbean Carnival chairman Mike Bisson said people had come from around the country to the "flagship" carnival, which continued on Sunday. "Whatever happened outside has no connection to the carnival and it will be safe today and the crowds are coming in. "The spirit of carnival is dance, music, vibrancy and well-behaved people enjoying themselves." Councillor Pat Karney said: "You can't tar a whole community because of some idiotic behaviour. "I think the fact that over 16,000 people came out to the carnival yesterday indicates the strength of the community here and their desire to celebrate their area." "The party I was at was beautiful," he said. "When I left there was lovely dancing. That's Moss Side, that's the culture. I'm in shock this morning." I was there enjoying the good vibes, having a drink, and then I noticed two crowds of youths gathering and I thought something might happen but I wasn't expecting a shooting. The next thing I heard was one gunshot, which I thought was a balloon or some kind of glass getting dropped, but then I heard two more and then there was a lot of panic. I went behind a wall because I didn't know whether it was the start of some kind of gun battle but I was safe. There was a man surrounded by people and he was injured but luckily he was alive. He was able to walk to the ambulance. It was quite a long time [before the police arrived] considering somebody had been shot but I think the ambulance was waiting for armed police - it was just informal security there - and then eventually the police did turn up. This is just a street party - it's nothing to do with the main carnival. In fact, organisers advise people not to go to the street parties because they are not officially affiliated or sanctioned by carnival. 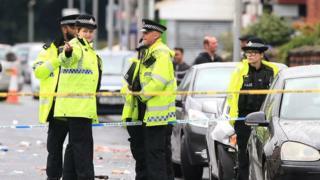 Greater Manchester deputy mayor Beverley Hughes praised police for "their swift action", saying the shooting was "very upsetting and it causes a deal of distress and people feel that their reputation is challenged again". She added: "I think the carnival, as well as being two days of intense enjoyment for the community, is a really important statement about where that community has come… and so I think for it to be abandoned would be a very unfortunate message." Det Sup Debbie Dooley said: "The area is being searched and examined while we are also trying to speak to as many people as possible and are reviewing CCTV to get all the facts." Extra officers will be patrolling the area over the coming days to reassure the public, she added. Since the 1980s, Moss Side has been associated with problems linked to drugs, gangs and violence. The Caribbean Carnival was meant to be a celebratory event, especially given the 70th anniversary of the arrival of the Windrush generation. Moss Side has done much work in the last few years to reinvent its image - in the past it had become notorious for violent crime. The events overnight will be seen as absolutely shocking for the local community. Officers will understand that and they will know there will be a lot of people who will be scared in their own homes - that is why they are putting on extra patrols over the coming days. Former police officer Martin Harding, who now works with local schools, said the number of shootings had significantly fallen in recent years. "It's another sign that some of the work in Moss Side - and neighbouring Hulme - is working because, going back, it used to be an almost a daily occurrence that there would be incidents of a similar nature taking place in the area," he said. He said the area, where a new Manchester Metropolitan University building is based, had a "proud community" and there would be "lots and lots of disappointment" with the latest shooting.